Game off. Match postponed. No game today, Just a few of the phrases that continued to come up on my twitter feed as the hours of Saturday morning ticked by. First, my intended game of Silsden vs West Didsbury & Chorlton fell by the wayside, followed up by my backups at Irlam and Northwich Manchester Villa. So, a short look down the road from my abode saw my gaze settle upon Shawe View and Trafford FC and a revisit to my old regular stomping ground. 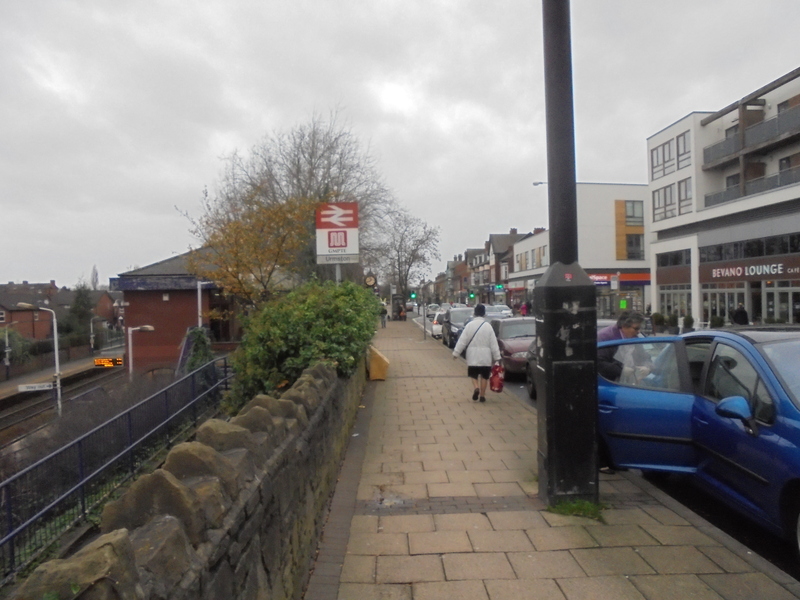 But first, a traverse through Urmston was to happen. After arranging with Paul of pitchsidepints a meeting place of the Steamhouse pub on the Liverpool-bound platform at the town’s station, I arrived in there for just before 12.30. After ordering a pint of Weinhenstephan (the oldest brewery in the world, don’cha know), Paul arrived along with his mate Dan and before long, the usual (on these pages anyway) Dan arrived. 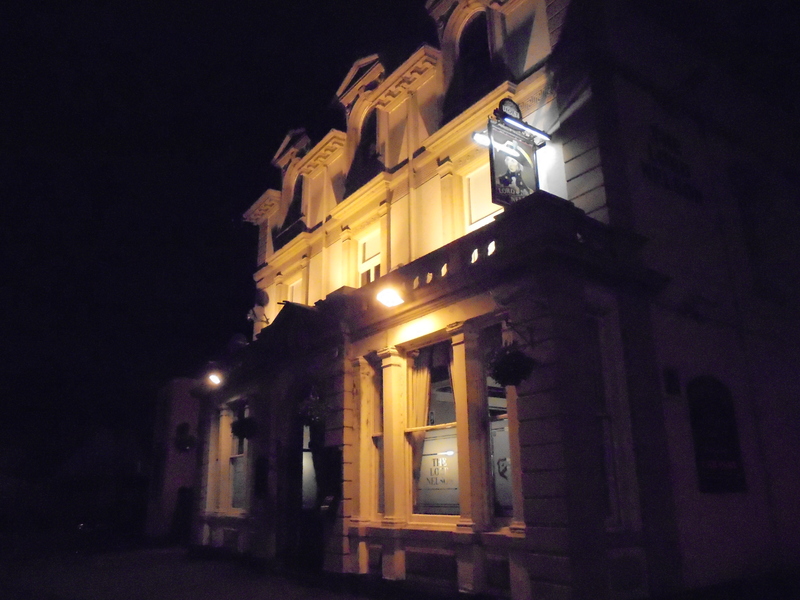 So, with our clique complete, we headed out of the station pub and up the steps back to street level and headed down the road to our next stop, The Britannia, after Dan had asked where the pool tables were at. Acting as tour guide, this was my recommendation. The Britannia is nothing special in terms of anything really and is rather bland and lacks atmosphere. 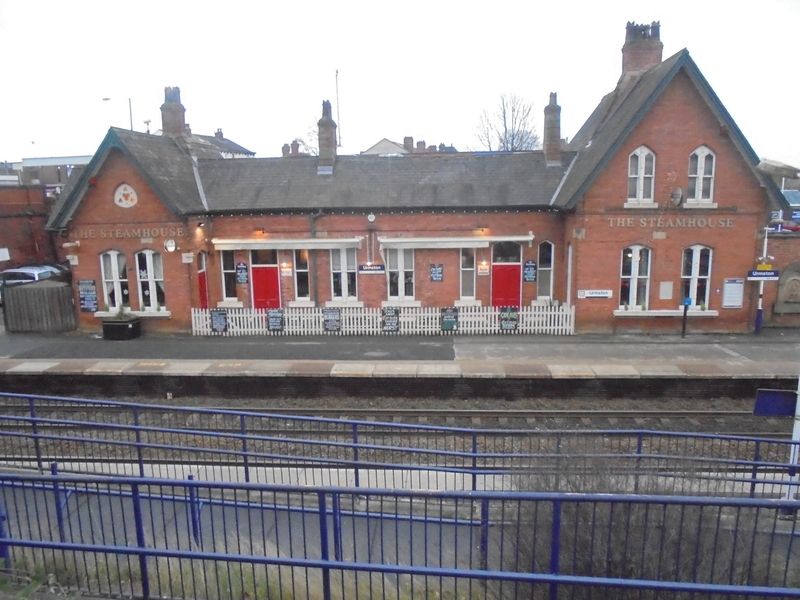 So, without a pool request, I wouldn’t have recommended it, unlike the Steamhouse which is full of character, due to it being a former station house and still set out in many ways as it was. 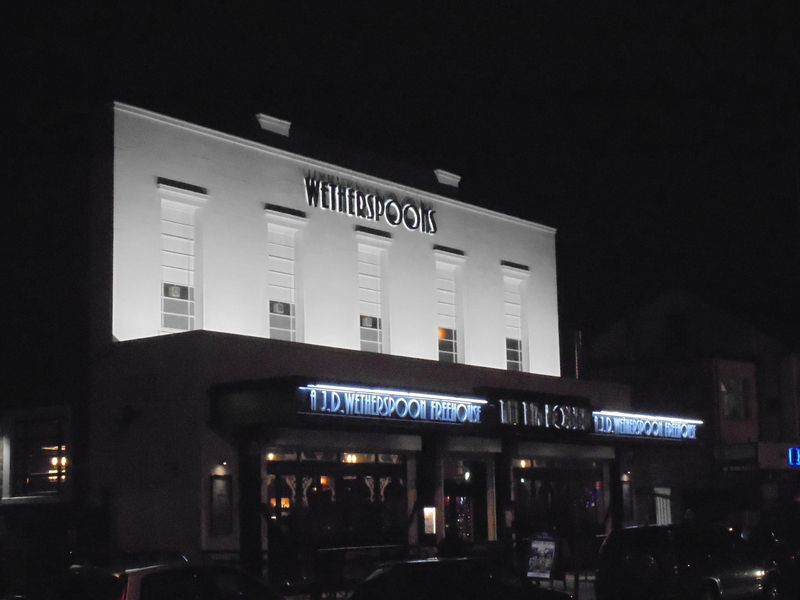 So, with a defeat and a joint win, I declared my retirement from pool after the latter victory and we headed back out and onwards to Urmston’s Wetherspoon’s, The Tim Bobbin. The Bobbin is in an old electrics showroom, though the building resembles more of an old picture house as Dan enquired to whether it was. I’m unsure if it ever was, as it is before my time, but I’ve always had a similar idea from viewing it. 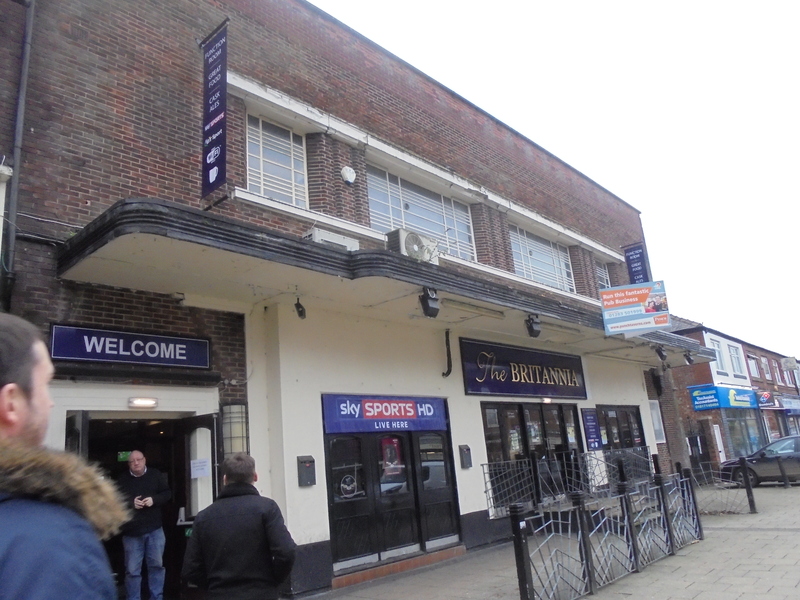 Either way, in here we all purchased our beers (2x Desperados in my case), before we were met by my mate and Trafford fan, Mike, better known as Cappy. I’d not seen Cappy since before I can remember, so it was nice to have a catch up prior to the game. It came about that Trafford were supporting Key 103’s Mission Christmas scheme and Cappy had bought one of those awful orangey-white balls that are used in the Prem for them to utilise. Sadly, I was unaware of this fact due to Trafford still being the only club to block me on the social media side of things largely due to…no, no I’m not going there again! 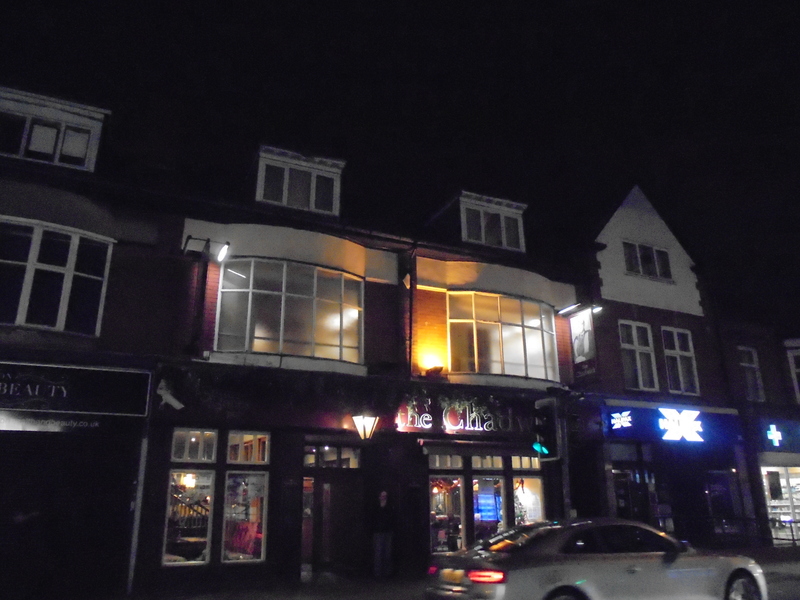 With drinks (mine especially frothy) finished, our five strong group headed off down the road and out of the town centre towards Shawe View, which is actually located within Flixton. A shortcut through Chassen Park sees you exit at the mouth of Shawe Road and from here, you head past the neighbouring pitch and down a narrow access road that runs parallel to the ground before you reach the turnstiles. Here, £8 was handed over for entry after Paul and Dan had utilised their very best ways and after a further £3 was handed over for a golden goal and programme together, I was officially into Shawe View itself. The ground is only quite small, with the main stand sitting upon the half-way line. This is all seater and neighbours the “clubhouse” (a mobile), the food hut and the tunnel leads to the dressing room areas that sit to the rear. Beyond the clubhouse and next to the turnstiles its a small open terrace, which affords a slightly higher view of the pitch. Behind the far goal is a covered standing area and the far touchline houses a dual seater/standing area, with a couple of rows of seating in front of a row of standing space. Behind the near end goal is open standing, with the ground’s grass mounds rendered obsolete due to the FA’s (and the country’s) OTT Health & Safety rules. Booooo! 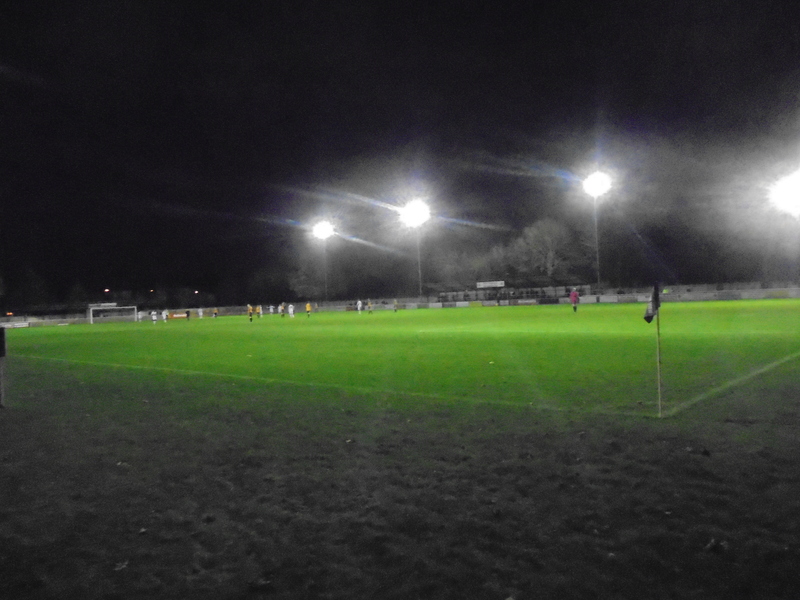 Trafford FC was formed in 1990 under the name of North Trafford (hence the still standing nickname). After originally being denied entry to the Mid-Cheshire League, a drop-out presented them with a place. After finishing runners-up in their inaugural season, the club were promoted to Division 1. After finishing fourth the next year, Trafford made the step up to the North West Counties Division 2. In 1994, they finished in second here and were promoted again, this time to Division 1 of the NWCFL. Upon this achievement, the club adopted their current title. 1997 saw Trafford win the NWCFL Division 1 and with it promotion to the Northern Premier League. In 2000, they won their first silverware at that level, the NPL President’s Cup, before being relegated three years later. After 5 years back in the NWCFL, the club were promoted again in 2008 and took a place in the NPL Division 1 North. 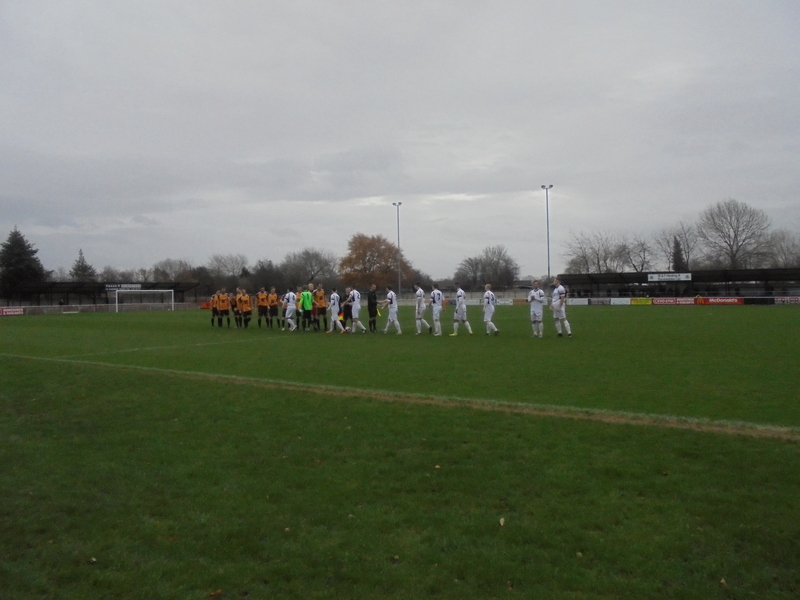 Their first season back at that level saw further success, as Trafford lifted the NPL President’s Cup in the 2008-’09 season with a 2-0 over Quorn at the opposing side’s home ground, the host ground decided on a coin toss! Manager Ged Kielty then left the club citing personal reasons, before being replaced by “club legend” Garry Vaughan. 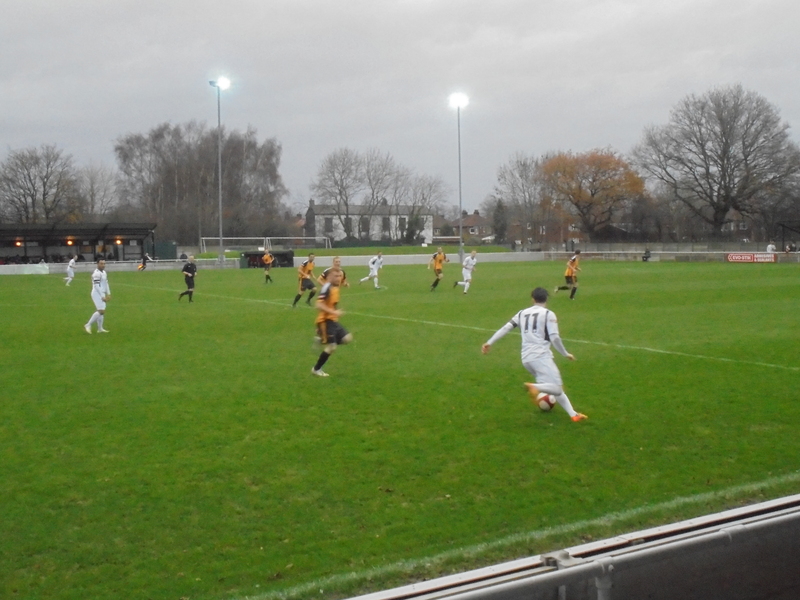 Under Vaughan’s tutelage, Trafford gained a foothold in the Division 1, before surprising many by managing to reach the play-offs of the Northern section. After defeating New Mills in the semi final, they travelled to Cammell Laird for the final where they beat the hosts on penalties to secure a place in the NPL Premier Division for the first time ever. Despite a good first season, finishing 12th, the results began to slide away and Vaughan was dismissed, replaced by Graham Heathcote. Heathcote, however, couldn’t turn things around and the club kept sliding down the slippery slope to relegation, before Heathcote stepped down at the season’s end to be replaced by Tom Baker. The game got underway with both teams looking to attack early. Paul and Dan both commented on how impressed they were early on with the visiting Unicorns from Yorkshire, and the side in gold proved their eye was right as Luke Porritt fired in after being awarded an age to pick his spot by some dire defending. 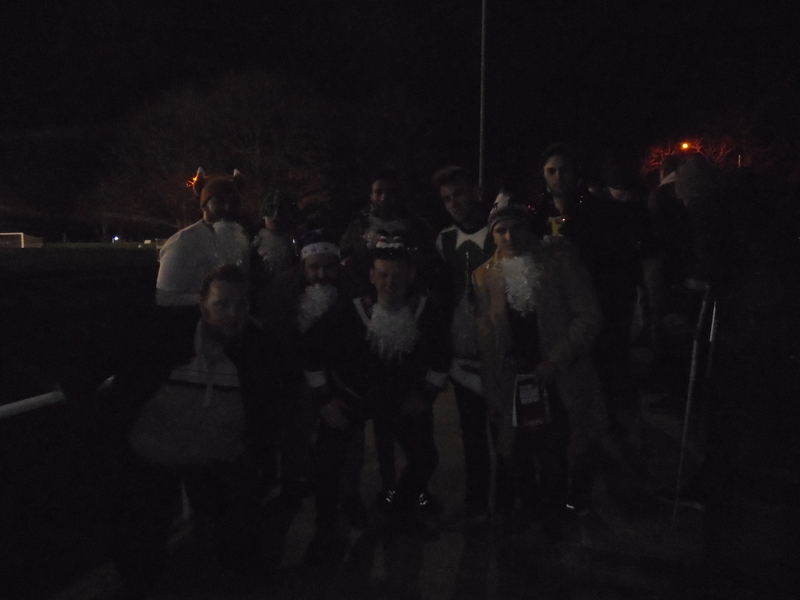 After five minutes, we headed on round to behind the goal, where I’d been advised by Trafford’s former manager/founder Dave Law, that a group of lads from London were located, dressed in a mix of weird and wacky Christmas related outfits, including one covered in fairy lights. After hearing their story of how they go to a game twice a year, give presents at Christmas and support charities, they originally planned to head to Stockport vs FC, but eventually settled on this game. We all felt around the sack and pulled out our gifts, a mug for Paul, a calculator for usual Dan, some “Tupperware” (a sandwich box) for me and a Toblerone for Dan. 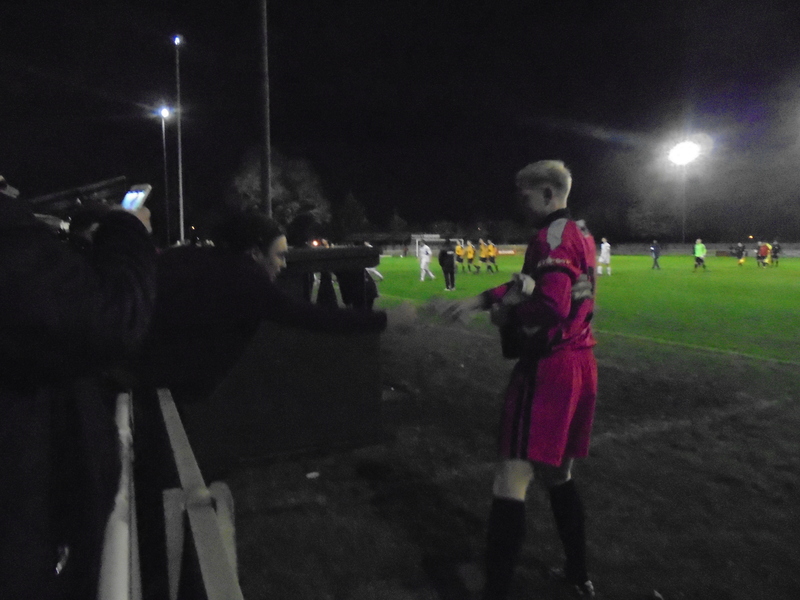 We were, understandably, delighted with our prizes, though Ossett ‘keeper Brett Souter probably wished he was having a quieter weekend, especially as I decided to sing “pretty in pink” to hi and everyone joined in. Sorry, Brett, but that kit looked awfully good on you! So, with very little happening on the field, I headed over to the food hut towards the end of the half and bought a chicken balti pie, peas and gravy for £2.30. Well worth the money it was too, as it was pretty good. Heading into the clubhouse at the break saw further Cockney-related shenanigans going on as I caught up with some more old faces during the 15 minutes or so. Soon enough, though, it was time to finish up the pie and head back out and into the bracing winds of Desmond for a second period that a very small percentage of those in the ground would have been looking forward to. 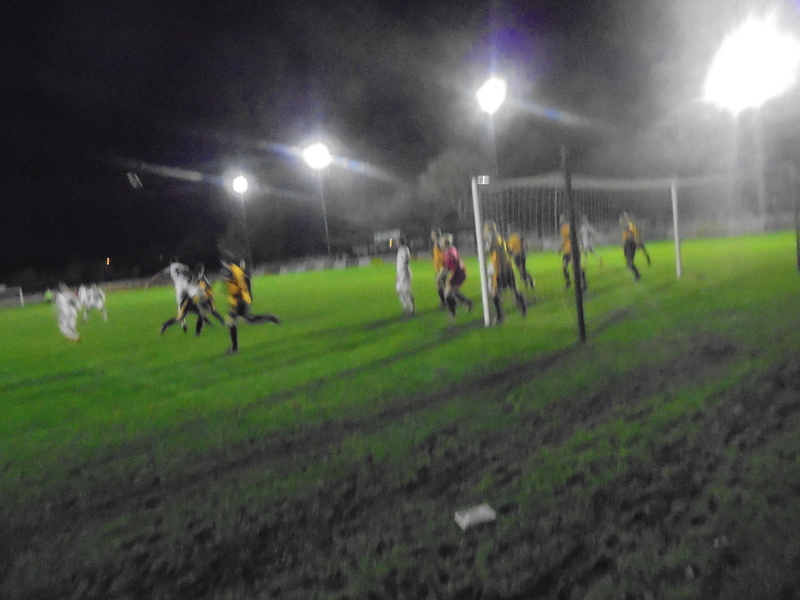 As usually happens in such conditions, chances continued to be at a premium with Ossett continuing to have the better of the play, though without really looking like adding to their lead. Added to that, nor did Trafford ever look like equalising especially when bringing on a sub after about 70 minutes, who proceeded to do nothing apart from lose the ball over and over again. Luckily for us, we had been somewhat accepted by the cockney crew and they continued their friendly barrage of shouts towards various players, none more so than poor Brett, who was given a free Smurfs DVD for his Xmas gift. Come the full-time whistle, the ‘keeper was clearly in celebratory mood as he retrieved his DVD and pulled a cracker over the perimeter boards. No, this is not a view on a person, but a Christmas Cracker. He did, however, refuse to read he joke, claiming there was nothing in it. Booooo. So, after a squad photo, we bid goodbye to the London lot (not before one exclaimed “Wait!”. He fixed his beard before continuing “I’m not supposed to be here!”) and headed out of Shawe View and traipsed back to Urmston, but not before Paul and Dan exclaimed their dislike at the Conservative Club on the way! On arrival back in Urmston, the Liverpool pairing headed on their way home and Dan and I headed into Chadwick’s to watch Chelsea vs Bournemouth. After an underwhelming first half, Dan said his mother wa in ‘Spoon’s so should we go there. 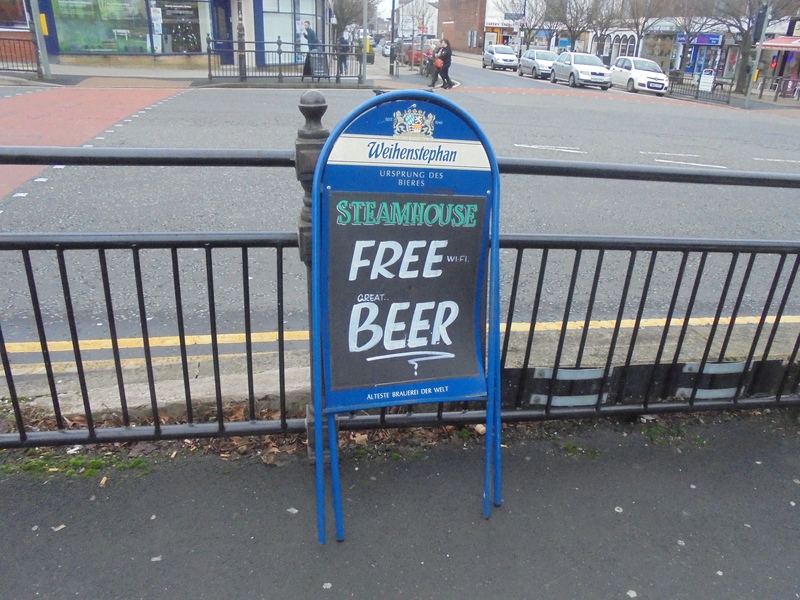 The offer of probably free beer was te main selling point, so back to the Tim Bobbin it was for a short period before Cappy met up with us again and we finished of the Urmstonian pub crawl with a visit to the HopHouse (in an old funeral home) and the Lord Nelson, the traditional old boozer. Dan left us shortly after we arrived here toget his bus back home, and Cappy and I finished off with a short trip into Manchester and their endeth our story. 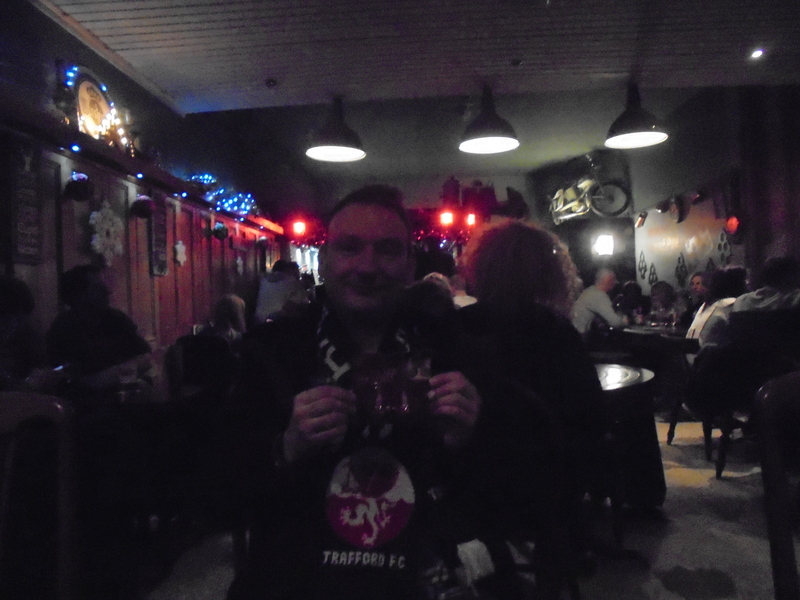 Cappy showing his colours in the Hop House! Game: 4- Poor overall, more down to conditions. Ground: 6- Nice enough, but not much to it now the mounds are out of action. Programme: 4- Very little in terms of club-related articles. Fans: 5- Rather subdued, not much atmosphere at all, but I guess it’s understandable. Food: 8- Well worth the price, as I said earlier. Value For Money: 7- Poor game, but a great day otherwise. Att: Around 16 at a count! For today I had two choices. Either attend another game at Trafford, as they entertained Blyth Spartans, or travel the short distance to Fallowfield, just past the ‘Curry Mile’ to Manchester City’s Academy Complex at Platt Lane, for Manchester Gregorians’ Manchester League game with Prestwich Heys. 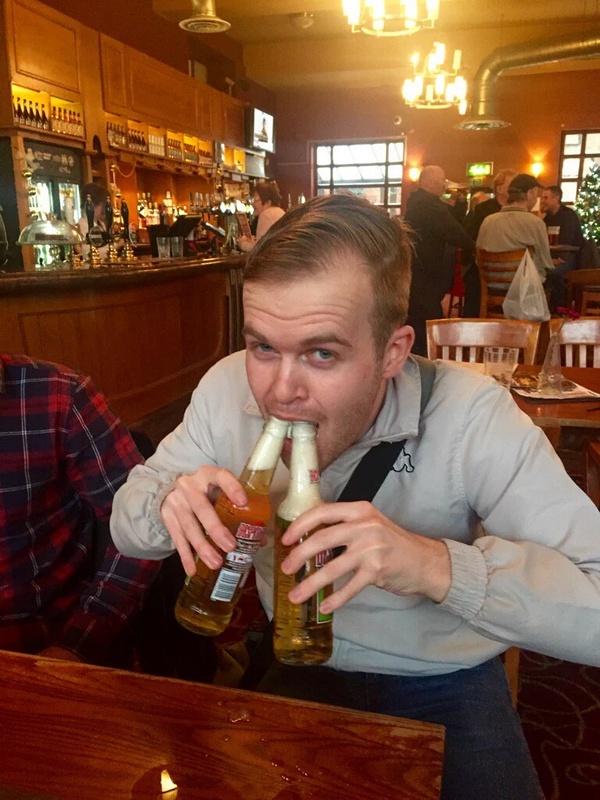 I have been planning to do another Heys game this season to catch up with ex-Trafford man Chris Mackay who now plies his trade with the club, after missing him earlier in the season, at Old Alts. In keeping with my word that I gave on Twitter the previous day, I was off to the complex situated not too far from City’s old home, Maine Road. 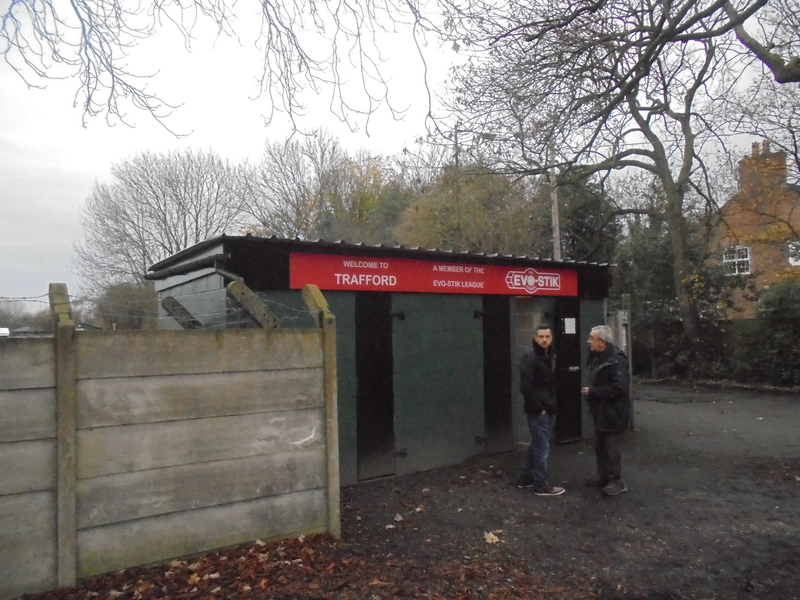 Beforehand, I had discovered, again on Twitter(if you haven’t figured by now, I am something of an addict of the social media site), that FC United‘s Development side were entertaining Hyde’s at a Manchester College Campus in Ardwick. So, this was where my day of football was to begin, after getting horribly lost due to my f*****g phone’s GPS again. I have come to the conclusion that GPS stands for ‘Generally Pretty Sh…. well, you get the picture! Arriving in the Campus, where Ardwick FC play, around 30 minutes late, I met up with my usual companion Dan Watkinson once again who would be heading to the Trafford game later in the day. I was also pleased to see none other than Bruno Silva playing goals, however this turned into something of a horror, when he received the ball, tried to beat the striker bearing down on him with a bit of skill, but this went horribly wrong, and the striker nicked the ball of him and walked it into the empty net. Oops! This was 1-0, and was how it remained until after half-time, when the same striker planted a looping header beyond the reach of Silva, to double his and his teams tally. FC dominated for much of the remaining 35 minutes, but endured a nervy last five, when they conceded a penalty, and the big, strong mountain of muscle wearing the 11 shirt confidently planted the penalty beyond the United keeper. However the Young Rebels saw out the game to take the points. After getting the bus back to Piccadilly (Ardwick is very easy to reach on bus btw), I bid farewell to Dan and headed off on the short trip to the Blue half of the city. Upon arrival, you are met with one of the grass pitches adjoining the pavement, and opposite the bus stop, which is directly outside the ground. After walking round to the car-park entrance, you walk straight on past the indoor training facilities, and onto a small path alongside a 3G and the academy pitch. The 3G was to be where the game would be played, the clue being both sides were on it. After the teams had come out, I had a small catch-up with Chris, who was starting the game on the bench, and observed the minutes silence, which was figured was for another league’s secretary. Chris made his way to the bench, whereupon I had a look round the ground to observe fencing surrounding it, which is commonplace in amateur football on these surfaces, and the indoor 5-a-side complex alongside it, where the dressing rooms are also located. The pitch, known as the ‘Maine Pitch’ actually played very well, but then considering where it is situated, this was of little surprise. 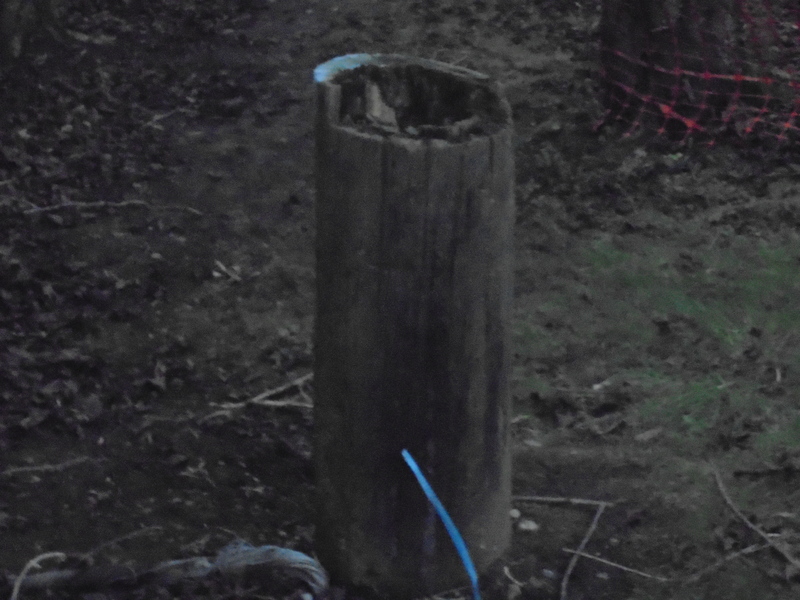 So, a little bit of history is called for I think…. 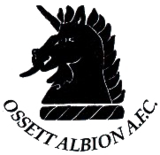 The current Manchester Gregorians F.C. dates from 1959, though there was an Old Gregorians team who pre-dated them, playing sporadically throughout the 1940’s and 50’s. The current club was formed by pupils of the local St. Gregory’s R.C. High School in Ardwick Green, which is located very close to the City Centre. They began by taking on the name of Old Gregorians AFC, playing in the Manchester Junior Catholic League. In 1962, the club stepped up to the Lancashire Amateur League, where it was successful throughout it’s time, including one season in particular, 1977-’78, when all six of the club’s sides won their respective divisions, the League Aggregate Trophy for most successful 1st and Reserve sides, and the League Trophy for most points per game taking into account all matches played by all its teams. They remained in the Lancashire Amateur League until 2005-’06 when they switched into the Manchester League, dropping the ‘Old’ prefix from their name, becoming simply Gregorians AFC. The club has continued to be successful, winning the league in 2008-’09, whereupon they added the ‘Manchester’ prefix to their name attaining the name they currently carry, and the Northern Counties FA Senior Cup whilst representing the Lancashire County FA in 2009-’10. They also finished as runners-up in 2010-’11 and finished in 8th place in the last campaign. The game began with little happening, but Gregorians slightly on top, until somewhat against the run of play, Heys broke on the counter started by goalkeeper Andy Jones, the ball was moved forward quickly to release ex-Manchester United player Paul Tierney, who squared the ball to young debutant Lewis Temple who fired confidently high into the net. Seconds later it was two, as the lightning-quick Erike Sousa broke down the right. 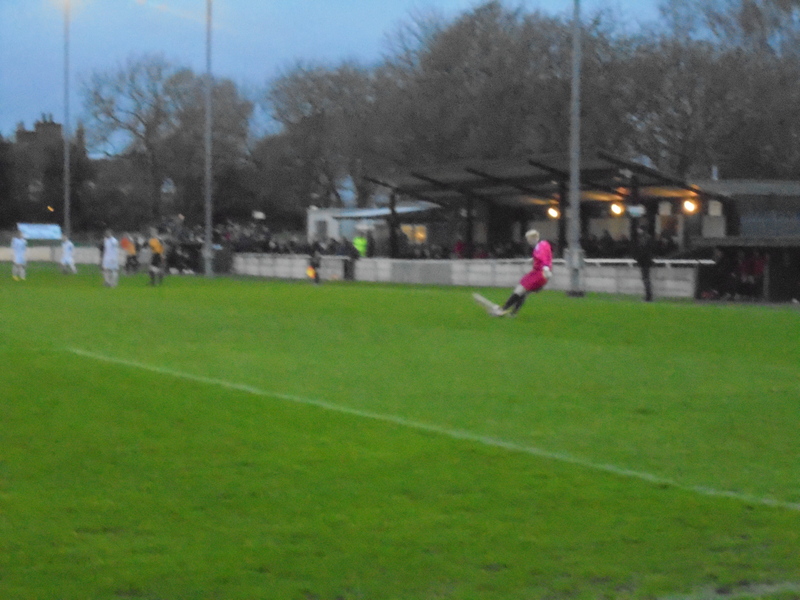 The winger fed Tierney who rounded Gregs’ keeper Allen Mills before firing in from the tightest of angles. By now, Heys were well on top, and appeared comfortable. However, they gave Gregs a lifeline just two minutes later. 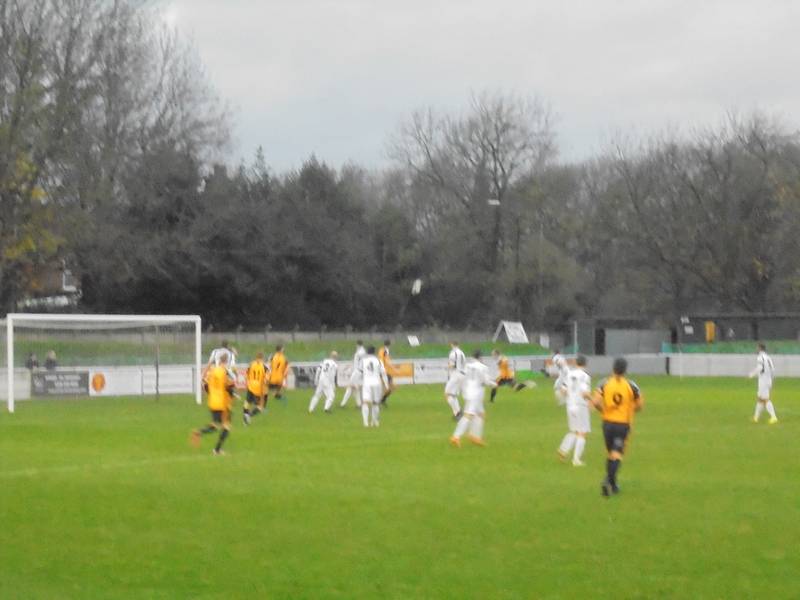 They won a corner on the right which was whipped in, and Ric Gunby rose highest to head past Jones. 2-1, and that was how it remained until the break, despite Gregs’ impressive Matt Dodwell heading wide as they grabbed the initiative and Danny Eyres forcing a decent stop from Mills down the other end. At half-time, the spectators headed for the 5-a-side complex, to escape the perishing, forceful wind. The facilities inside consisted of three vending machines, one offering hot drinks, the other two a variety of snacks. I resisted the temptation of the sweet snacks, but got some much needed warmth off of a hot-chocolate, which was of good quality. I also took a Platt Lane leaflet to commemorate my visit due to the lack of a programme, which wasn’t unexpected. As the teams re-entered the field, the hardy bunch of fans, with 10 at least travelling from Prestwich, headed back outside into the wind, which at this time resembled something out of a disaster movie. Ok, maybe not that bad, but it was quite gusty! It now seemed as though all the initiative sat with the home side, and Heys introduced all three subs at their disposal, Darius Photiou, who impressed me at Old Alts earlier in the season, Martin Love, who scored a screamer in the same game, and Chris Mackay, who scores from half-way on occasion. So, something had to give, one way or another! It seemed as though it was Gregs who would take the points as Tom Ward broke clear and only a superb save by Jones with his legs kept him out. This seemed to dispirit the home side somewhat, and with just two minutes left Heys were awarded a golden opportunity to take the points when Martin Love progressed into the box and was felled by a clumsy challenge, and the referee had little hesitation in pointing to the spot. This was much to the delight, and somewhat disbelief of the Heys faithful, as the ref had had a bit of a shocker so far, getting quite a lot wrong, and generally talking to players for much longer than he had to, sometimes going into a full-blown conversation. Cue the usual’ We’re here to watch the football, not you’ shout, which on this occasion, was more than justified! As I grabbed the 111 back to Chorlton and another bus onwards to Urmston, I was able to catch the last few minutes of the Trafford game too, which incidentally finished in a 2-1 success for the ‘North’. 170 minutes of football in one day. I was happy with that!! Game: 9- End to end, it was action packed all the way through. Ground: 6- Not much to it really, but for what it is, it’s tidy and a quality surface. Programme: N/A- although the club are looking at producing one later in the season & possibly next season too. Fans: 10- The couple of Gregs fans/volunteers were very friendly and welcoming. Food: 7- Well, drink really. Good for a vending machine.